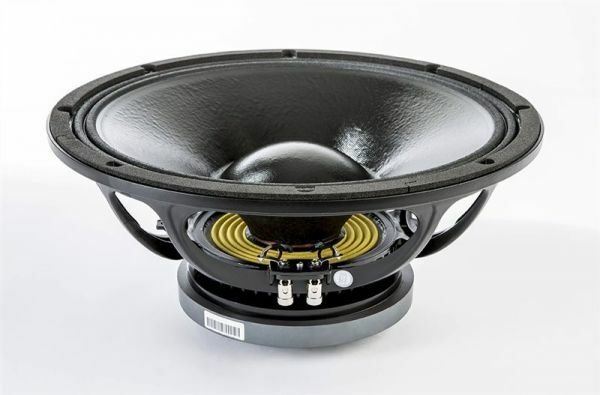 Produktinformationen "18s 15W930 8 Ohm"
The 15W930 low frequency transducer meets the specific market demand for a ceramic version of our industry standard 15ND930 extended low frequency transducer with 75 mm Ø copper edge wound voice coil. Thanks to its versatility, the 15W930 can be used in 2-way compact reflex enclosures with a 1.4" compression driver, in multiway systems and in high loading sub woofers as small as 70 lt (compact reflex, bandpass and horn loaded configurations). The deep profile curvilinear cone, made with high strength wood pulp, has been designed to achieve the best possible linearity within its frequency range. The cone surround, made from a linen material, is highly resistant to aging and fatigue. The in-house developed cone treatment is humidity repellent and significantly dampens bell mode resonances. The 75mm (3in) copper edge-wound voice coil assembly is wound on a strong fiberglas former to improve force transmission and power handling. The already low distortion and high sound quality are further improved by the aluminum demodulating ring (SDR) used to reproduce instantaneous peak on mid frequencies, reducing intermodulation distortion. The magnetic structure has been optimized using our FEA CAD software that has maximized the flux density in the voice coil gap. Excellent heat dissipation has also been achieved by incorporating air channels between the basket and the magnetic top plate. Due to the increase in use of audio systems at outdoor events, the ability of the 15W930 to perform in adverse weather conditions or in areas of high humidity is a great advantage. This has been achieved using exclusive treatments which enable the cone and the magnetic plate to resist corrosion and render the cone water repellent at the same time. Weiterführende Links zu "18s 15W930 8 Ohm"
Kundenbewertungen für "18s 15W930 8 Ohm"